World Book Encyclopedia, Volume 6 , Field Enterprises - Educational Corporation, USA 1972, P. 73. Beyond the market or bazaar, in a separate part of town, rose the high walls that screened the houses of the rich. These homes, with mud-brick walls, wooden pillars, and palm-trunk rafters, were usually built around a courtyard. The windows were high, the doors small, to keep out sun and let in air. Mats that could be rolled up like shades covered the windows. There were rugs on the floor and bright carpets on the walls. Pillars were built in the shape of trees, with the column painted reddish brown and the leafy top or capitol, bright green. Like the sky, the ceiling was blue. Included were workrooms and servants' quarters and the homes sometimes had as many as seventy rooms. The rich man in his house slept on a wood-frame bed made of interlaced cords. with folded sheets fir a mattress and with a wooden headrest. Under his bed was a chamberpot. 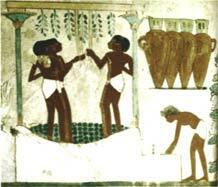 The wealthy Egyptian loved to give a good "beer house", as he called a dinner party. In early times, men squatted at mealtime on rugs and cushions. Servants placed a small stand before every two persons and served the food in bowls and the beer in jugs. In later times, there were tables and chairs, even chairs that could be folded up and put away in the chests and baskets that served as cupboards. A good host decorated everything with flowers - the table, the beer jugs, and the guests. Servants placed cones of perfumed ointment on the heads of the guests. These looked like large ice cream cones and, like ice cream, melted. They dripped over wigs and clothes, staining everything yellow, but they added a delightful scent to the air. 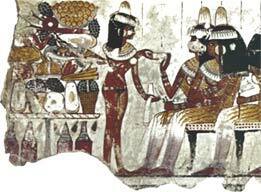 In the tomb painting shown to the above right, fashionable ladies recieve a dish of refreshments from a slave girl at a party. Note the "cones" of perfume on their wigs. Musicians played during the meal. The guests were served many courses and several beers and wines and the party was considered a great success if most of the guests ended up drunk or sick. Wealthy Egyptians built beautiful. spacious homes of brick and wood. They draped brightly colored hangings over latticed windows. Luxurious furnishings, such as rugs, ebony chests, and vessels of copper and gold decorated the homes. Gardens and orchards surrounded almost all the houses. They ate beef, veal, antelope and gazelle meat, fruits, honeyed sweetmeats, and several kinds of bread and cakes. In the tomb painting seen to the left, workers tread grapes for a noble's estate. Egyptian wines were labeled with date, vineyard and variety to benefit the tax assessors, not connoisseurs. Persons who could afford them wore wide, round collars of jewels or beads, They decorated their wrists and upper arms with beautiful rings and gay bracelets. Both for beauty and protection from the heat, wealthy Egyptians wore long. heavy black wigs of sheep's wool or human hair. Sometimes they wore striped or embroidered headdresses to signify the wearer's social standing.